IEBC officials are staging election rigging, CORD says – Kenyatta University TV (KUTV). All Rights Reserved. The coalition for reforms and Democracy (CORD) has accused the Independent Electoral and Boundaries commission officials of staging election rigging in 2017. The general elections are expected to be held on August 8th next, while the process of selecting new IEBC officials is currently ongoing. The post for IEBC had been re-advertised after the first batch interviewed was said to have failed to pass integrity test. Addressing a presser today, Wiper Party leader and Cord co-principal Stephen Kalonzo Musyoka said that democratic elections are needed full of fairness and transparency. “IEBC carried out random inspection of registration forms in an unfair way not scrutinizing the dead registered voters and even failing to sort the double registration,” the Wiper chair said while addressing a presser. “IEBC is continuing with the aim of tampering with voter registration,” he added. CORD further blamed the already axed IEBC officials saying that they cannot continue occupying the office and give tenders. In respect to their blame on IEBC officials, CORD has tabled various demands as a way of ensuring that free and fair elections are carried out in 2017. 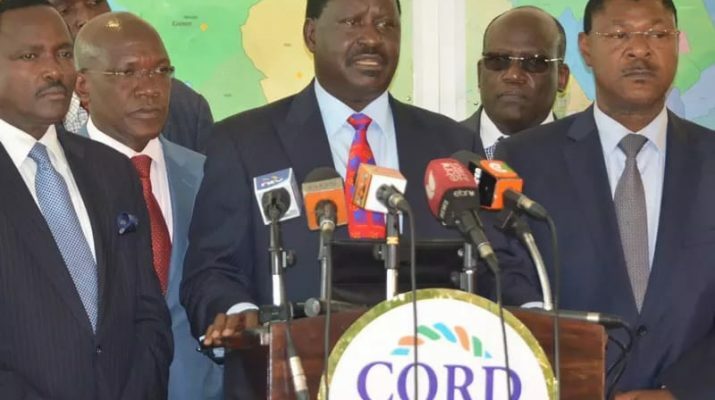 Cord demands that he already fired IEBC team leaves the office, stops issuing tenders with the new team brought to service by the end of 23 December this year. The opposition further wants a fresh audit of votes to be carried out by a reputable firm that should be publicly declared to avoid creating the tension of malpractice. Upon fresh audit of the votes, CORD demands that the voters should be put in the portal where the public can access them.